Click here for a Photo Album of this year’s Classic. The Jim Tanner Caddy Classic was a success! We had a perfect day! 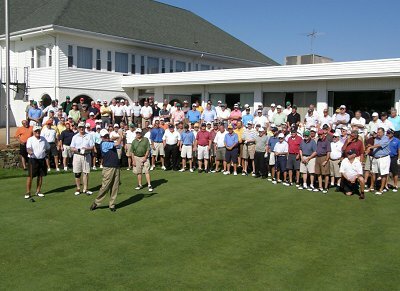 132 golfers assembled at Pawtucket Country Club to celebrate a tradition. Our ex-caddy guests arrived from as far away as San Diego, Dallas, Florida and Atlanta. Jimmy Noonan drove from Baltsurol. Tim O’Neil drove from Darien, Ct and Les Kennedy, Jr. drove up from Purchase, NY. Clint Dailey played in my foursome and had flown in from Cincinnati. The scores were not as important as the stories that were told. I heard that Jeremy Hall shot 69 and eagled 12. Norm Lutz scored 74. Roland Snead chipped in for an eagle on 11. (Email me your story and I will post it). The Ryder Cup format had two teams, “The Super Loopers” versus “The Flytraps” competing. Each foursome competed for 4 points. The first nine holes was a best ball team match worth 2 points and the second nine had two individual matches worth one point each. After nine holes, a new match began. The slate is wiped clean. A chance for some to change the outcome. Dave Kalafarski “Ski” made an excellent par putt on the tenth to start the backside one up. It was a 20 footer slightly down hill with a two ball break right to left. My match with Ski went back and forth with some great shots and a few not so great. The match was decided on 18 when Dave rolled in a 15 footer to secure a point! Clint Dailey and Bob Ferguson had a similar back and forth duel. Clint made an excellent par on the final hole to secure a point for the “Flytraps”. Final tally in our group was 2 points each. Unlike most golf tournaments, half the field went home victorious. They will have bragging rights until next year. The Jim Tanner Caddy Classic raised a bunch of money for the newly endowed “Jim Tanner Caddy Scholarship”. We had a prize list that was second to none with $2,800 in individual cash donations, 20 of the best golf course in RI and MA donating foursomes for auction, Sox and PATS tickets, golf clubs, bags, balls, restaurant certificates, an imported wine basket and much, much more. A list of all items and the final donation to the Burke will be posted on the web site soon. While putting this event together, I spoke with many friends that told me that they were very happy that we were recognizing Jim Tanner. The word that was most often used to describe their relationship with Jim Tanner was mentor. Mentor is defined as a teacher, a trusted friend, an individual that is more experienced. Jim Tanner was a teacher for many of us and a trusted friend for all that participated in the “JT Classic”. Congratulations Jim! The foursomes will be posted on the RIGA web site rigalinks.org on Friday. The unique experience of having been a golf caddy in 20th century America is something that I came to fully appreciate only decades later, as is the case with most former “loopers”. The experience taught us much about the value of a work ethic and many other life lessons that weren’t apparent at the time. While we were traipsing the sod and enjoying all the hijinks involved (and believe me- there’s a vast apocrypha of legends, oft-told tales and sordid stories in a looper’s life, Harry), our minds were absorbing each and every experience to process the data and find the nuggets of truth that would stand us in good stead for the remainder of our days. Things like: Keep up. Know when to keep your flytrap closed. Keep the clubs clean. Wear a clean shirt. Take your share of pins and forecaddying duties. Swap bags when necessary. Work together. Do whatever you can to help your players. Teach the younger caddies. Simple, yet invaluable lessons. It comes as no surprise to me that any caddy worth his weight when young often ended up successful in life. Mentors were found and followed, friendships formed and the hallowed halls of the eternal fellowship of caddies were entered-usually a tentative first foray followed by a hearty embracing of the lifestyle. Early mornings, polishing the caddy bench, shagging balls for terrible golfers, cleaning carts, sweeping out the cart room – you had to be willing to do whatever was asked to even earn the right to catch a loop. I loved it, as did most of us. Preeminent among the role models, teachers and mentors at Pawtucket Country Club was Jim “JT” Tanner, our caddymaster extraordinaire. Firm, fair, funny and demanding-he was often a boy’s first real boss, someone to whom we thankfully paid the royal tribute of two bits after each outing. And it was a reward to catch a loop-there were so many other lads just as eager to work as we were. JT balanced the demands of the members with his realization of our youth, yet he was no easy taskmaster. He broached no nonsense and his admonition to “hit the boulevard” was caddy jargon for “you’re fired”. Yet, he was willing to give second chances if you showed a desire to work and showed up consistently, kept your nose clean and “did the right thing”. Once you earned his respect, you were rewarded with friendship and opportunity. So, we the former loopers of Pawtucket Country Club, will be honoring our friend and mentor on June 28th with the Jim Tanner Caddy Classic. 72 former caddies, course and pro shop workers and friends will gather to honor JT and the caddying tradition that opened so many doors to so many of us. It’s a tribute to a man who has been a fixture for over 50 years at PCC . We’ll be playing the Jim Tanner Caddy Classic as a Ryder Cup format tournament of three six-hole matches, then passing the hat for donations in JT’s name to the Burke scholarship fund- a scholarship that has been instrumental in the lives of many of us. It’s our way of showing our respect, admiration and appreciation to the man we believe to be The Greatest Caddymaster Ever. Thanks, JT. Our lives are ever so much richer for having known you, O Colorful One.